The Camino provides a unique space to stop learning from our regular patterns of behaviors. We are out of our normal element and have time to reflect to open up to thinking about life in a truly different and unique way. Jacob Barnett, now 14 year old prodigy, with an IQ higher than Einstein shares that this is where many of the worlds great breakthroughs came from, “Stop learning – Start Thinking & Creating”. This provides a space that opens a GATEWAY to your own personal revelations, inspirations, and creations that can touch and transform our world for the better. 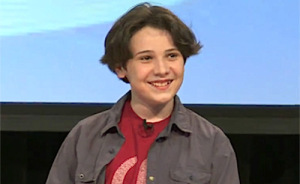 “Jacob Barnett is an American mathematician and child prodigy. At 8 years old, Jacob began sneaking into the back of college lectures at IUPUI. After being diagnosed with autism since the age of two and placed in his school’s special ed. program, Jacob’s teachers and doctors were astonished to learn he was able to teach calculus to college students. Thank you Timothy J O’Connor for your Facebook post that inspired today’s blog. This entry was posted in Camino Inspirations! and tagged camino, creativity, Inspiration, spirituality. Bookmark the permalink.